This topic provides an overview of creating and managing API authentication credentials. 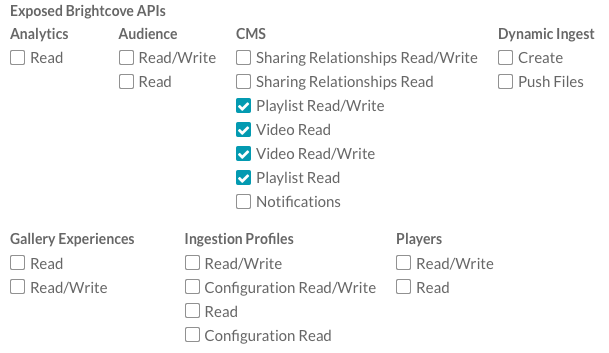 When you use the Video Cloud APIs, your method calls will require access tokens unless you enable basic authentication in the Player Service Settings. For more information on enabling basic authentication, see Managing Account Settings. Note: This feature is only available for Professional and Enterprise accounts. The API Authentication page is used to create new client registrations. When creating registrations, you can select the service and the roles that will be enabled with the registration. Note: Only the client registrations for the account you are logged into will display. Enter a Name and Description for the client registration. Select one or more of your accounts for authorization. Select the API(s) and permission(s) to enable for this registration. Note: Selecting a large number of accounts and APIs may cause the HTTP header size to become large and invalid. The maximum header size that our server accepts is 8K, which means that you must select 30 accounts or less to apply the credentials to. For security reasons, we recommend that you limit the scope of permissions for a set of credentials to the smallest set of accounts and operations necessary. A Client ID and Client Secret will be returned. Note: Copy the client secret and store it in a secure location as the client secret will not be displayed again. The API Authentication page can be used to view and manage client registrations. Click the ADMIN link in the Studio header and then click API Authentication. A list of your current registrations will display. Note that if a credential is created for multiple accounts, users will only see that credential if they have access to all of those accounts. For example, User 1 creates a credential for accounts A & B. User 2 logs in and only has access to account A. User 2 will not see the credential as they do not have access to account B. To delete a client registration, click the delete icon( ) next to the registration or edit the registration and click Delete Registration. Deleting a registration permanently disables it and cannot be undone. You can create a unique Client ID and Client Secret for each Video Cloud account that’s set up as a content source in DFP. For example, if you have 10 Video Cloud accounts, you'd have 10 applications named DFP in your API Authentication settings in Video Cloud. You can create a single Client ID and Client Secret for all Video Cloud accounts that have been set up as content sources in DFP. For example, if you have 10 Video Cloud accounts, you'd have 1 application named DFP in your API Authentication settings in Video Cloud. Option #1 takes more time up front. However, if the Client ID and Client Secret are the same across all content sources (as with option #2), it will be a burden to add a new content source because you will need to generate a new Client ID and Client Secret and update all of content sources in DFP. So, Brightcove recommends option #1.